One major aspect that caregivers need to consider is the fragility of senior citizens. Abrasions, cuts and wounds have to be cleaned immediately since they’re at a higher risk for infection. 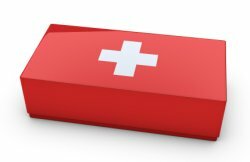 To that end, first aid kits should be stocked with bandages of different sizes and several antibiotic creams. The sad reality is that elderly people are prone to falling and their fragile bones often result in broken bones, fractures or sprains. The elderly have more fragile bones and should have medical attention after any serious fall. In cases when the senior citizen you’re taking care of falls down, the first thing you need to do is to check for bleeding and try to control it. Caregivers should also make sure that blood circulation isn’t blocked. This blocked circulation often manifests by the blue color that appears on fingertips or toes. In first aid and CPR courses, caregivers are taught not to move the victim or attempt to reset the bone. Instead, wrap ice in cloth and gently place it on the affected area until professional help arrives. Keep the patient calm and comfortable. Diabetes is one disease that afflicts the majority of elderly people. The two types of diabetic conditions people should be aware of are low blood sugar and high blood sugar. Caregivers in charge of diabetics with low blood sugar should always have a roll of candy with them. If you notice your charge is going into diabetic shock, get the patient to sit down before calling 911 or your patient’s own doctor. Poisoning happens when the elderly makes a mistake and accidentally takes too much medication or gets confused and ingests the wrong medicine. Caretakers should get rid of all toxic substances in the home. Medications should also be organized as necessary as the elderly sometimes have difficulty remembering if they’ve taken their medicine or if they’ve taken the right dosage. It’s a good idea to jot down information like the name of the medicine, the dosage and when it should be taken and keeping copies in the home and in the wallets of both the patient and the caregiver. It’s scary to see someone undergoing a seizure since the person can only ride it out. The basic rule to remember when in charge of someone who suffers from seizures is to keep that person safe until the episode is over and consciousness returns. To better stack the odds in your favor, turn the patient gently on their side and check that they’re breathing. Caregivers are trained to let seizures end naturally. The patient shouldn’t be held down as this might cause broken bones but instead should be consistently reassured in a soft and kind voice. There are instances when CPR has to be administered. In this situation, the caregiver should remember that the patient’s bone strength is already severely compromised. However, there are several good St Mark James programs that can arm you with the right training to help the elderly. Taking care of the elderly can become easier if one gets the right first aid training.